Blue Heron Book Works, 9780996817745, 226pp. Blue Heron Book Works loves stories and we are dedicated to the idea that everyone's individual story-not just those who live in the glare of the celebrity spotlight-is essential to the bigger story of who we are. It's not politically correct to assign characteristics to nationalities, and in fact most Americans wouldn't consider being American a nationality, claiming that we all come from somewhere else. And yet, after even one generation here-often sooner-the thing that we all have in common, the thing that makes us American, asserts itself and that is this: we look at everything with a child-like sense of the new. Nothing has associations that can't be reworked or reimagined. That's what Americans do: we reinvent ourselves constantly, create ourselves from scratch because all of us are starting over in some way. It's this looking at a situation for what it is without the judgement of generations that makes us the most creative people on the planet. 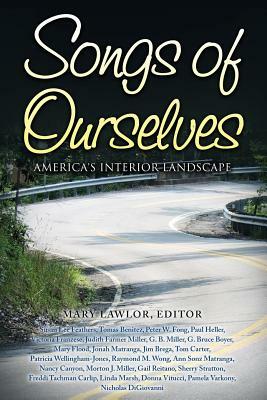 This quintessential American point of view is captured beautifully in journals and blogs, letters, in unedited and unreflective short bursts of observation and it is what we are celebrating in Songs of Ourselves.